The best part about the holidays is getting to spend time with family, and one of the best parts about spending time with family is watching my mother move around the kitchen, settling herself into the most uncomfortable looking positions for great lengths of time, prepping massive amounts of food, often with at least three things going on the oven, stove, and microwave. She is a juggler in the kitchen, an army general in food prep, a master of cooking, and terribly generous with her time, energy, and culinary talent — especially when it comes to feeding her family all their favorite foods. 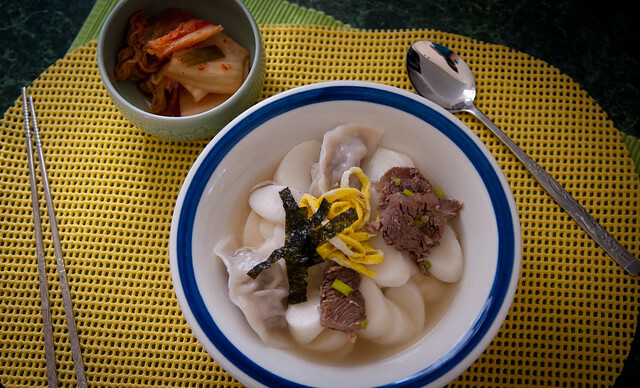 When she learned that my sister and I were coming for Christmas, she promptly went out and bought ten pounds of short ribs for galbi, duk-gook and mandu for duk-gook soup, and made a vat of my favorite Korean spicy stew. The staple to every meal in a Korean household is kimchi, and this year I had the pleasure of watching my mother make tons of it to hand out as holiday gifts to her friends. 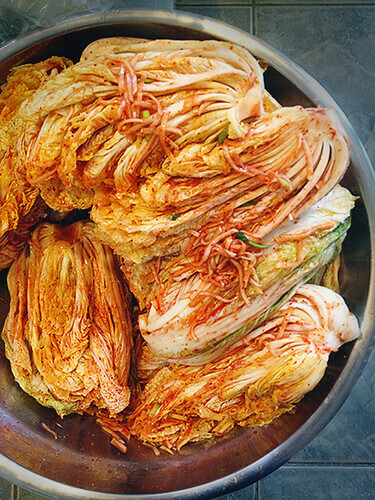 There are many ways to make kimchi, of course, but we are kimchi snobs and know our good kimchi from our bad. Needless to say, my mom makes very good kimchi.